This will always be the moment in history when Kia got serious about superminis. It has been clear since the new Rio's static launch in Geneva last March that with this new, third generation model, the company was moving rapidly up the class pecking order. The Rio is now a longer, lower, wider, better equipped and much better looking model - in a class where no fewer than 45 nameplates do battle. What we didn't know, until now, was how it performed. We took to the road in the new transverse front drive 1.4-litre, 89bhp diesel Rio, which emits just 109g/km of CO2, and took a shorter drive in the 108bhp, 1.4-litre stop-start petrol version, whose emissions are hardly greater at 119 g/km. Both cars confirmed that the Rio - 4405mm long, so one of the biggest and roomiest cars in is class - offers truly surprising big-car refinement: low wind and road noise, surprisingly little tyre noise over bumps, and very well suppressed engine noise. The petrol model is by far the zippier, accelerating from 0-62 mph in 11.5 seconds to a 114mph top speed, whereas the diesel can only manage 14.4 seconds and 108mph, and feels surprisingly flat at around 2000 rpm, where most diesels are torquey. This one needs to be revved, only really giving of its best over 2400rpm, but running out of revs at 4500. Both versions, admirably for this class, have six-speed transmissions and cruise very quietly. Economy is the diesel's forte; it delivers a combined 68.9mpg against the 1.4 petrol engine's 55.4mpg, though there's even an even better economy option in the Rio range, a 1.1-litre diesel triple that sips just 88.3mpg in its most economical guise. The Rio is generally fun to drive, stable in corners and - on 16-inch wheels at least - quiet over bumps. The steering is less impressive, a little vague at the straight-ahead, and having a feeling of 'stiction' either side of it, which you don't find in the best. This, though, is the Rio's most prominent fault. Interior quality is ahead of a Fiesta. Though pricing and precise equipment line-up won't be decided until closer to the September launch, Rios will clap between £10,500 and £15,000 or "95 per cent of a basket of competitors" as marketing men put it. One thing is now clear: the smallest Kia is no longer an also-ran. I really admire how far Kia the South Koreans have come; this looks like real progress. One thing bugs me, however: this is supposed to be a supermini, so why is it so freaking massive?! A seriously impressive little (or not so little) car, and looks like Kia have been paying attention to the little things too; 2 12V sockets are so useful. The rear does remind me of a Mk1 Seat Leon albeit that's no bad thing. Not so impressed by the diesel, 89bhp should be able to muster a sub 14 second 0-60 time. I like the sound of the economy of the 1.1 diesel but will it move? When I first saw the main photo of the front I thought I was looking at the Vauxhall Astra! 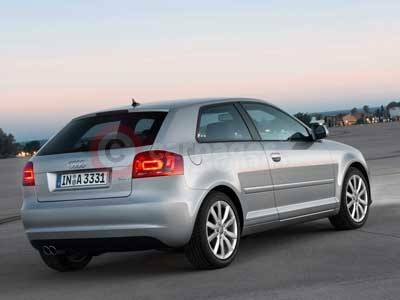 And the back end is very similar to a Seat hatch from a generation ago. And the interior, while nicely built (going by the report) looks pretty non-descript. I'm not surprised, it is a big car! I have trouble in seeing how it can be classified in the Fiesta class. 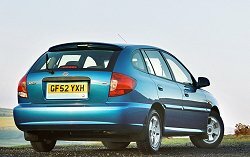 It wasn't so long ago, the Peugeot 306 - classified in the Focus sized class - was under 4 meters! The overall length is 4045mm with 2570mm wheelbase. Diesel triple, nearly 90mpg - and you're complaining it's too big? Not a market I'm in but looks and sounds like a big step up for Kia. Interesting comments on interior quality, from the pictures the interior is certainly far easier on the eye (if a tad bland) than the hideous current Fiesta. You see, this car I do not find depressing. When I hear the name Rio however, all I think of is a cartoon parrot. Now all I see when I look at this car is a parrot. Though, the interior is quite tidy. Not a patch on the original - 2 versions back. Kia has gone chasing the 'yooth' and forgot who the Rio used to serve so well and its loyal following that gave Kia its leg up - the Grey pound. The original was cheap as chips with a good discount too. It was ahead of its time as it was one of the first lifestyle estates - Volvo or Audi produce one and no one scoffs but Kia were viciously ridiculed. It was cheap to run, roomy and had enough cargo space for OAP's to drive their arthritic Beagle to the park or 6 bags of hedge trimmings to the tip. This one won't. I don't think Kia have 'come on' or 'made progress' I think they got there quite a while ago, in fact its time for them to launch a cheap sub-brand!